Welcome to the beautiful country hunting house in Willingen-Bömighausen. You expect about 80 square meters comfortably furnished living space divided into 1 living room with fireplace, 1 kitchen, 1 bedroom with double bed and TV, 1 bedroom with 2 single beds and TV, 1 shower / WC and a small conservatory. Enjoy the peace and the unique charm that this house exudes. In every season there are many activities that you can start directly from the house. Willingen can be reached in about 10 minutes. The next ski lift awaits you in Usseln and is about 8 km away. The Edersee can be reached in about 30 minutes. The Diemelsee can be reached in about 20 minutes. 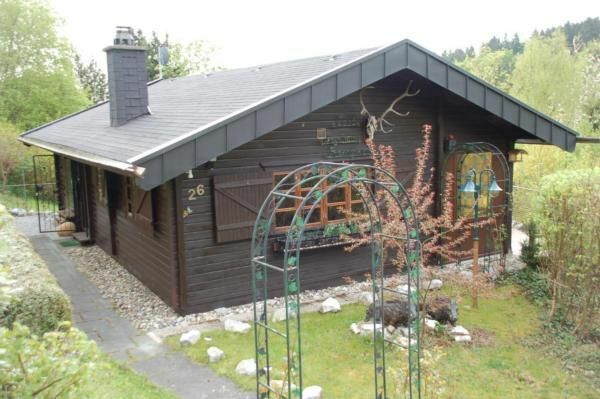 Our beautiful country hunting house is located in a beautiful district of Willingen. The house is located in a cottage area and offers you plenty of space. I am pleased to welcome you as a guest and I wish you a warm welcome. Willingen-Bömighausen is located about 13 km from the Willinger center and is a nice little village located directly on the Uplandsteig. - Local tax / tourist tax: per person and day costs of 0. 7 EUR (obligatory). - Pet: per pet and day costs of 3 EUR (compulsory). In Bömighausen you will find in every season the right thing for your holiday: a small lake for swimming and fishing, cozy Sweden houses, children's playground, Kneipp facility and beautiful hiking trails and lots of nature. Internet (per object and day, included in the price 0 EUR). Firewood (per object and day, included in the price 0 EUR). Parking (per object and day, included in the price 0 EUR).